All good things must come to an end, and that was sadly the knowledge I took with me as we crossed the line into the final state on our epic Route 66 drive across the country, California. Route 66 is about so much more than a simple drive; it’s about embracing the generations of people who tackled the same path before us, whether to find new opportunities out west or simply to take the family on a grand adventure. For most, California was always the goal, the destination they planned to reach and so it was armed with this knowledge that we sought to make the most out of the final days of the adventure. There isn’t that much to see and do in the state along Route 66 though, it really is about the finish line. However, there were a few stops that excited me, as well as the epic conclusion to the drive itself. There was no fanfare, no fireworks as we crossed the line into our final state on the drive – California. No, instead we were met with wide-open roads and parched deserts, a no-man’s land along the Mother Road. To add insult to injury, this is also about the time we had our only major hiccup along the entire 2,400-mile drive; something we couldn’t have predicted in any way. In this part of the country Route 66 has been reimagined into the National Trails Highway, and a brief section of it was closed for repair when we arrived. Apparently this isn’t a new event, it’s been closed for a while, but we weren’t the only through-drivers stopped at the hazard signs wondering what to do next. We stopped, consulted the maps and found the shortest detour possible to get us back on Route 66. It meant more highway driving than I would have liked, but sadly it was entirely unavoidable. 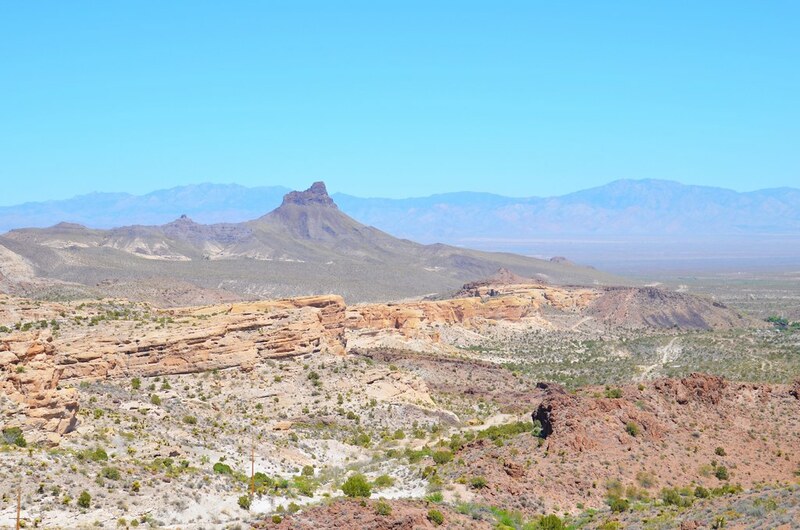 Speeding through the barren Mojave Desert we drove through towns like Needles and Goffs. It was on this day that I was happy we timed the trip for early May, before the deserts reached their sizzling summer temperatures. It’s also on this section that very real world concerns like having enough gas are crucial. If you can, gas up in Arizona before crossing over into California to save yourself a few bucks. I wish I could say that the first part of the drive in California was interesting or momentous, but it wasn’t really; at least not until we reached Amboy. I spent months meticulously researching our drive along Route 66, trying to isolate important places and sights that I really wanted to see and experience. One of those is located in this rural part of California and like my visit to the Grand Canyon, it meant spending a little time off of Route 66. Once we reached Amboy, home to the iconic Route 66 establishment Roy’s Motel and Café (and some of the most expensive gas I’ve ever seen) we turned off the Mother Road for an overnight jaunt to Twentynine Palms and Joshua Tree National Park. Few things excite me as much as the promise of stunning natural landscapes, and I had wanted to visit this quiet National Park for a very long time. Staying at the incredibly well located and comfortable Fairfield Inn & Suites Twentynine Palms-Joshua Tree National Park, it was the ideal home base to briefly explore this remarkable part of California. Since we were losing light, we drove directly to the National Park, the perfect time of day really for those gorgeous sunset shots we all love. Joshua Tree itself is well worth the hype; a beautiful national park full of those famous stunted trees along with other features, like giant boulders perfect for scampering and a fair amount of wildlife. Although we didn’t spend a lot of time in the park, I was thankful for the experience and even more thankful to get a proper night’s rest before starting the last day of the drive. Part of my daily Route 66 routine was to enjoy a quiet dinner alone, my various maps and guidebooks open to reconfirm my research for the next day’s drive. I made alterations to the schedule and came up with an approximate drive time, so that Brendan and I knew when to leave and when we thought we would arrive at the daily rest stop. Even though Joshua Tree isn’t really that far from Santa Monica, I kept coming up with an absurdly long drive time for our final day. It was so extreme that Brendan thought I had finally made a mistake but, much to both of our chagrin, I was all too accurate. The drive from Amboy to Los Angeles at first was just as desolate and empty as the first day of California driving. 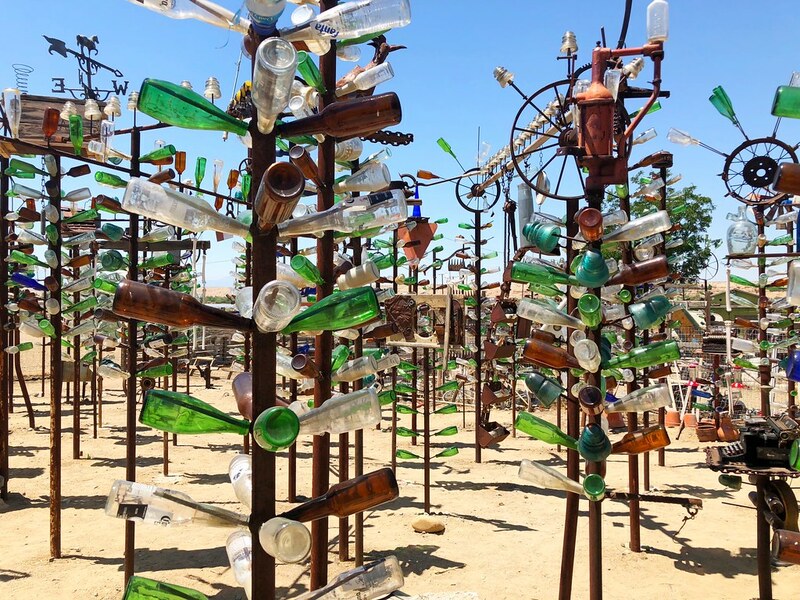 Passing through many small, dusty towns with names like Dagget and Helendale, there wasn’t much to see other than the odd novelty, like the Bottle Tree Ranch. This quirky spot has been in development for decades and started with the bottle collection of Elmer Long. Today it’s a de facto art installation with hundreds of bottle stands creating a weird forest of glass and found items. As it turns out, that brief rest stop was important since we were about to start the strangely hardest leg of Route 66. Los Angeles is a sprawling city comprised of an almost innumerable array of suburbs and small towns. We entered this mass of urbanity in San Bernardino and a stretch of Route 66 that, although famous to those in the know, sits largely undiscovered by locals. 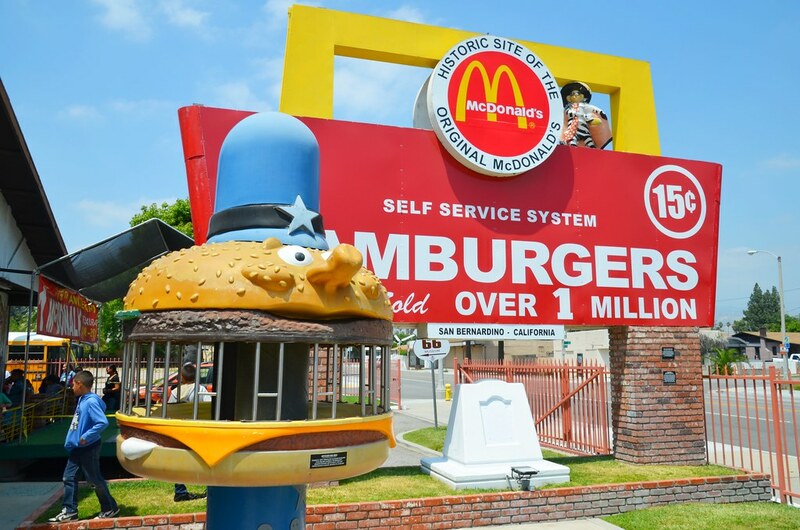 Before starting the suburban marathon stretch of the drive, we stopped briefly at the Original McDonald’s Site and Museum mostly out of my own love affair with the fast food giant. This is where the original restaurant stood and although it has since been replaced with this small museum, it was an important pilgrimage for me to make. From there we turned onto Foothill Boulevard and the misery began. What is now Foothill is also the original Route 66 and it winds along the same path as the Mother Road. Decades ago, these were small towns, sleepy hamlets located not too from L.A. and set amongst rolling farms. Today it’s a stretch of road with what felt like millions of stop lights and suburban sprawl the likes of which I have never before seen and hope to never again experience. It was endless with more “pointless” shopping centers and subdivisions than I thought possible. Due to those stop lights and the constant line of cars and humanity, this section of Route 66 took us hours – HOURS – to complete. It seemed incomprehensible that we could be so close and yet so far away from our final goal, the end of Route 66. At one point it was so extreme I was honestly worried we wouldn’t make it to Santa Monica before nightfall. It was also this stretch of the Mother Road that caused me to have some much deeper thoughts about the drive, the U.S. and even my own life. I plan on addressing these in a separate post, but after two weeks driving across America mostly through small towns and quiet roads, to suddenly be in the middle of mass American consumerism was almost too much for me to take. It all seemed suddenly and profoundly pointless. The people living there have no idea what exists so close to their homes, the opportunity to experience Route 66 and to learn more about their own country. But these thoughts belong in a much different type of post. Finally we broke through the suburban labyrinth, drove into Pasadena and eventually downtown L.A. herself, continuing on to the official end of Route 66. Technically, Route 66 ends on the corner of Lincoln and Olympic in Santa Monica, but that’s not the famous finish line. No, instead the city’s pier – a floating festival – is where many choose to end their epic drive. With Everclear’s “Santa Monica” blaring in the background, we parked on the pier and almost drunkenly walked over to the shield marking the end of the road. Dozens of tourists were there, taking their photos in front of the sign no doubt seeking to imbue themselves with a little bit of the Route’s magic. That made me a little angry at first. I had just spent two weeks driving the entirety of Route 66 from Chicago without detour (mostly) or interruption. I painstakingly researched and recreated the original drive, staying faithful to its spirit at every step. Then I realized that they were only looking for the same thing I was, a return to a Golden Era of American history, a more innocent and even peaceful past. Brendan and I hugged, I teared up and suddenly didn’t know what to do. I was in an instant without focus or direction; a feeling I didn’t like at all. 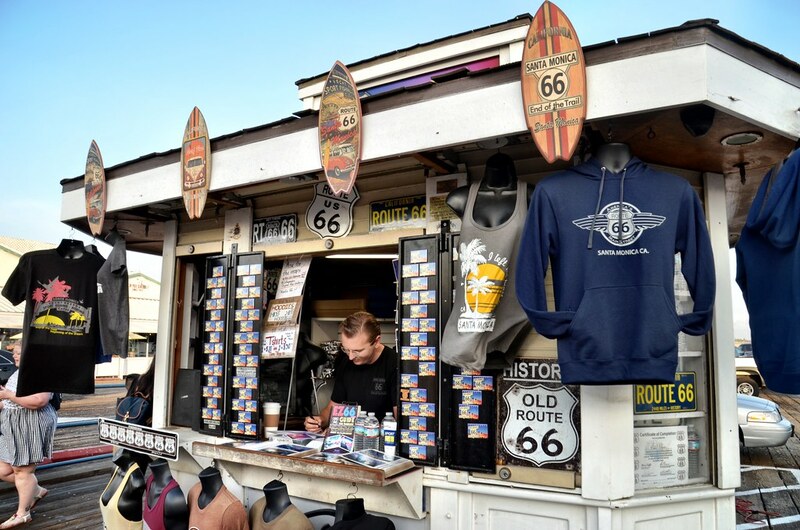 On the pier is a small kiosk selling Route 66 souvenirs. It’s manned by Mother Road purists though, individuals who themselves have driven the Route many times and who are part of the quiet army of caretakers that exist across the country. I bought a novelty “I Drove Route 66” certificate and then we walked back to the car. Our hotel for the evening, the luxury Le Méridien Delfina Santa Monica, was only a few blocks away and honestly I couldn’t wait for a little pampering. Although the champagne and incredible service was nice though, I still felt lost. For two weeks my life had been one thing and one thing only, Route 66. I spent months, even years, preparing for it and once it was over I was somewhat inconsolable. Even now, I think back to the experience with a sort of longing that is new to me. I take a lot of nice trips to some fairly incredible corners of the world, but few have left me with such a fierce desire to return as has Route 66. I would give anything to jump back into the car and do it all over again; revisiting favorite spots and visiting ones I missed the first time. I’m not entirely sure why I feel this way either. Maybe it’s a longing to continue that reconnection with my own country, but honestly I think it’s something more than that. It was just a whole lot of fun. Brendan was the ideal driving partner and together we had an incredible experience seeing America as she really is, warts and all. Although this post completes my state-by-state recap of the Route 66 experience, I have so much more to share as I continue to learn from this true bucket list adventure. This post was created in partnership with Marriott International, but all thoughts and opinions are entirely my own.